I believe in signs, don’t you?! And sometimes a sign might come in the form of a spoonbill! I was recently walking one of my favorite beaches – I adore the beach – and I noticed a line – a long line in the sand that clearly had been created by a sea creature moving. My curiosity got the best of me. As I visually followed it away from the shoreline, I saw a spoonbill. – I have NEVER seen a spoonbill in the wild! – I forgot all about this curious line and what kind of creature created it; my attention was now focused on this beautiful, unique bird. You see, my parents address is Spoonbill #10. My mother passed 3 1/2 years ago, and I was in Florida with my sister checking up on dad. It isn’t looking good and all the variables, choices, decisions has us both reeling. 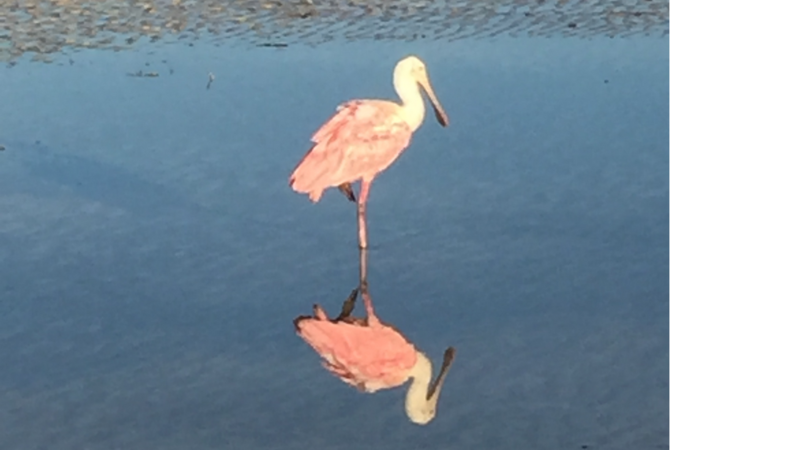 My prayer just before this miraculous spoonbill sighting was – I don’t know what to pray.